I have checked these tefillin before and have noted this issue, however the owner of these tefillin would now like a conclusive opinion on whether the revach is suitable or he should change the parshiyos. Reb Moshe's opinion would be appreciated. 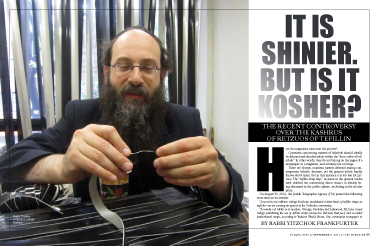 I thought I'd post the link to the Ami Magazine Article featuring forum member and frequent poster Rabbi Shmuel Traube AKA Bais Hastam (Pictured).